Shared Earth is celebrating a landmark anniversary, 30 years of selling Fair Trade products. 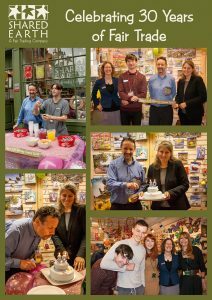 Rachael Maskell MP for York Central joined staff, guests and customers to mark the occasion in Shared Earth’s York shop. Jeremy Piercy, who founded the business, said: "It’s a great feeling to know that you have kept a business going through many difficult years, when most of the shops around you have changed hands, often many times. "This would not have been possible were it not for the wonderful support of our customers who obviously want to buy great handmade products, but they are also glad that their purchases are benefitting others and not just themselves.